Tuesday DANCE LAB... Dance as Tribe! This weeks theme for all of us everywhere to dance with all week ... drum roll please! A sacred space created for us to get a dose of dance medicine together after our work day ! Together we create an electric healing field of light and inspiration for each other to explore, express and release in, the shamanic way of dance. The voice is the completion of our dance. In tribal dances movement, voice and music making was not separated it was one and the same medicine. The shamanic medicine that extracted negative energies, and returned vital essence! The dance began with our heart beat and our breath. In rhythm with the earth. With each breath we make sound. Experiment with how your exhales create different sounds in different rhythms and movement patterns. Give your self permission to be like a wild creature that clicks and moans and roars and hisses. Allow your voice to be released as you are shaking free or expressing the energy of a specific body part. Go Deep and let your organs speak and purify through sound. Free form dance labs are so important for personal healing, release and building your movement vocabulary. They support our bodies in warming up for other more structured dance classes and our hectic lives by giving us more full body presence. It is a time to pause and be lead by your body. To respond to your body and to listen to your body. A time to discover the subtle truths within your body. When we let go of looking outside ourselves for guidance, information, and answers and go inward there is a whole universe - a fabulous private unique universe thats all for you. A healing room all your own. Purify and Vision this new Year with The moving Voice! 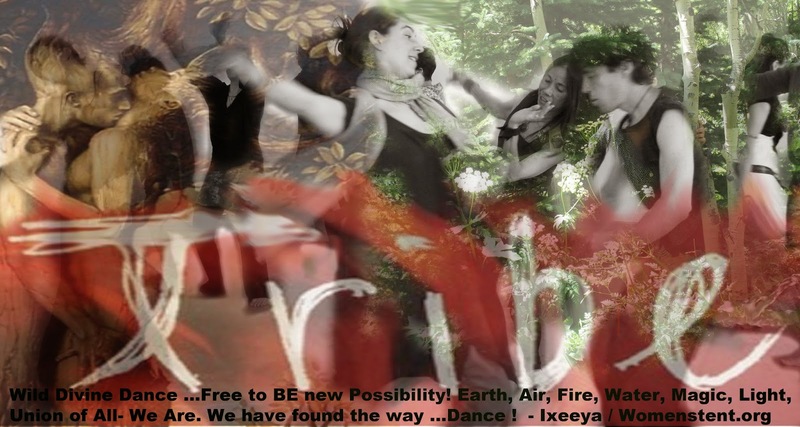 *Dance Lab with Ixeeya is a weekly gathering that offers a weekly space to explore urban shamanic dance. Each week we journey with an embodiment theme and simple guidance to initiate your free form dance journey. You have 45 min to express yourself and explore the theme and how it lives in you. At the end of our Journey we will come back together for a simple guided ritual sharing. This Dance Lab is a fusion of the 5 rhythm dance maps, the Chakra Symbol maps and the somatic resourcing and ritual arts developed by Ixeeya Lin, Melissa Michaels and Gabrial Roth.